Update: The render below is fake, with the color changed to red with a bit of Photoshop trickery. That means we’re still looking at black (ceramic and regular), white, green, blue, and yellow color options for the Galaxy S10. A few days ago, we spotted a render of what could be the Canary Yellow Samsung Galaxy S10e online. Today, we stumbled upon yet another colour variant of the Galaxy S10; this time it’s the Cinnabar Red version. So far, we know that the Galaxy S10 will be available in black, white, blue, and green. 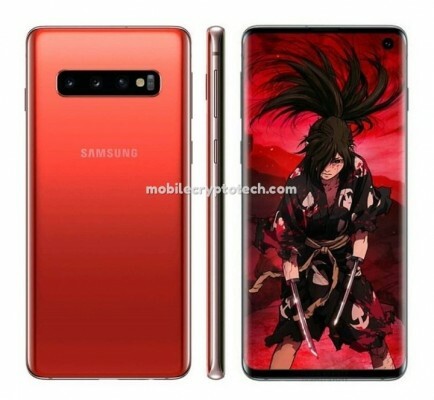 The Cinnabar Red variant may be limited to the Galaxy S10, much like the Canary Yellow colour, which is most likely going to be exclusive to the Galaxy S10e. Judging by the colour, it is very likely that this particular variant could be a limited edition or region-locked exclusive. It will likely be intended for the Chinese markets, where the colour holds a lot of cultural significance. We could even see it making its way to Samsung’s home base in Korea and a few Asian markets, but an international release seems unlikely. Red coloured phones are a rarity in most western countries and we don’t see Samsung breaking that norm anytime soon. We’ll know soon-ish, considering that the much-awaited launch event for the Galaxy S10 is just around the corner. From what we know about the Galaxy S10 so far, it promises to be an excellent upgrade from the Galaxy S9 with features like a triple-camera setup and punch hole Infinity-O display. I’m using transparent case to show my Samsung color to everyone. Hope there is a red colour option for the S10+ I’ve been wanted a red samsung for a long time now.